The December/January Trestleboard is now online. You may locate it by clicking here, or by navigating to the Trestleboard link at the top of the page. 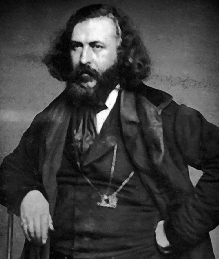 Albert Pike would have been 201 years old today (born December 29, 1809). Popularly known as the modern founder of the updated Scottish Rite degrees, he made several other contributions to Masonry in general. Look forward to seeing everyone at the Mason Inn! Bro. Paul Evancoe will speak on The Scottish Rite. Due to inclement driving conditions, tonight’s meeting is canceled. Thank you. UPDATE: Tonight’s meeting has been canceled. It has been tentatively scheduled for the 21st. Date: Thursday, 16 December 2010. The Lodge will begin labor at 7:00pm; go to refreshment for dinner; reconvene after dinner to finish business and close. Dinner will be $30 and for that the Mason Inn will also provide us with a secure meeting room. RSVP’s are essential as the Lodge has to order and partially pay for the meals several days prior to the meeting. So please let the WM or Secretary know that you are coming. Prepayment is strongly encouraged as the Lodge must make a substantial pre-payment a week before the meeting. Menu is still to be determined….it will be forwarded as soon as it is available. The Patriot Lodge wishes a happy birthday to the Marine Corps and an honorable Veterans Day to all those who served. Thank you all for your service. See the slideshow below, or go to Bro. Baumbach’s Picasaweb site for more details. More media is forthcoming.